If you enjoy an espresso drink and are tired of going to your local coffee shop all the time for it, then consider getting your own espresso machine so that you can start enjoying delicious espresso brews at home. An espresso machine can help you conveniently create cappuccinos, mochas, macchiatos, and lattes in your very own kitchen. It is important to understand that there a number of different types of espresso machines that all make espressos in a different way. Before you invest in an espresso machine, you need to make sure you decide what would be best for you. One is not better than the other, in terms of type of machine; it is just a matter of personal preference. If you are looking for a machine where all you have to do is push a button, then you probably want to go with a super automatic. But, if you are looking for a machine that gives you control over the espresso, a manual machine might be more your type. If you like having control over your espresso and don’t want to turn over the grinding and tamping to the machine, you might want to look into a manual lever espresso machine. A manual lever is a personal experience that allows you to get as hands-on with your espresso as possible. You grind your own beans, you add the water, and then you heat the water and physically force it through. There are two types of manual lever machines; those that use a spring piston, and those that do not. The spring piston machine is going to operate by pulling a lever against the spring, which then exerts the force for extraction. A machine that does not have a spring piston exerts force directly on the lever to create the extraction. Not only are manual lever machines good if you want to get hands-on with your espresso, but they are also good, dependable machines. The pure simplicity of the machine makes them a sophisticated and reliable machine. There are no electronic parts to go wrong; it is just you forcing the water through to make the espresso. No pumps, no nothing, besides you. This is how espressos were originally made, and the simplicity eliminates something going wrong. For some of the best in manual lever espresso machines, look at the La Pavoni Romantic Professional and the Elektra S1. The Romantica Professional is a lever-operated espresso machine that puts you in charge of the brewing process. The Elektra S1 is a beautiful machine that makes quality espresso and cappuccino. If you are too sluggish in the morning to worry over all the fuss of grinding and steaming your own espresso, then a super automatic is the perfect machine. You can have top-of-the-line espresso beverages at the touch of a button. 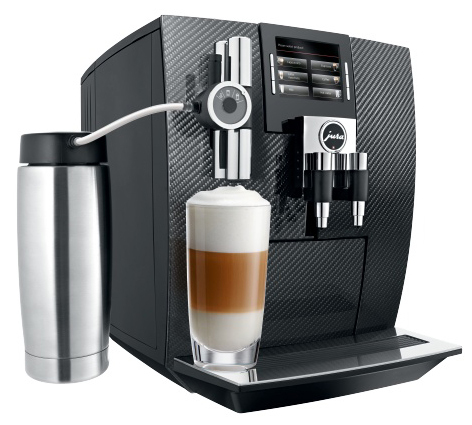 For those who want a quality, all-in-one machine, a super automatic espresso machine is the way to go. It is the ultimate in convenience and will not disappoint. A super automatic espresso machine is going to automate the whole espresso process for you. It is going to grind the beans, froth the milk, pump the water; everything, without you having to do much of anything. These machines can consistently brew exceptional beverages. They have a temperature control system that makes sure you get the perfect cup every time. The built-in grinder is going to tamp and extract the espresso automatically. Additionally, these machines have the ability to froth and dispense milk automatically, which gives you more options for milk-based espresso drinks like lattes and cappuccinos. If you are looking for the top of the line in super automatic espresso machines, look at the Jura Giga 5. This machines features two burr grinders and two heating systems so that it can provide two specialty drinks simultaneously. This is the perfect machine for those who demand the highest standards of quality in their espresso machines. Always remember that the type of machine you should buy should be based on personal preference. Don’t think just because a super automatic has the word super in it, it means that it is the best machine out there. True, it might be, but that depends on your preference. If you are up to the challenge of mastering hand-crafted espresso machines, then go with a manual lever. If that isn’t your cup of coffee, try an easy to use super automatic.